Just for Fun is an ultimate entertainment blog. 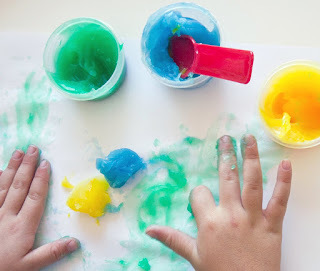 We're feeling a bit under the weather at the Adams house today, so I thought I would share our recipe for fingerpaint instead of a craft. Hopefully everyone will be feeling well again soon so that we can share a few fall projects! If you like any of the above picture and want to share it with your friends on Facebook, Pinterest, Twitter, Google+ etc. then use the below sharing buttons.